The Time Out marketplace opened a year ago, right after we left last year, so we ate there for the first time. And multiple times after that! The restaurant scene in Lisbon is getting more interesting and exciting year by year. What follows are my evaluations of the places where we ate during our months of living in Lisbon in 2012, 2014, and 2015 grouped into categories. I hope you will find this helpful if you travel to Lisbon, and that you will add your impressions of these and other Lisbon eateries in the comment section. When we return to Lisbon we will try your suggestions and incorporate them into the next edition of this listing. This year, the main development I noticed was the addition of excellent and innovative soups to the menus at a number of the restaurants we visited. Belcanto (Largo de São Carlos 10; phone 213-420-607). This is Lisbon’s most interesting and successful effort at molecular cuisine, making use of first class ingredients. Chef Jose Avillez richly deserves his Michelin star. 100 Maneiras (Largo da Trindade 9; phone 910-307-575 http://www.restaurante100maneiras.com/?q=N/-/46). They have both a café and a restaurant with a single tasting menu. The café menu has an excellent variety of interesting dishes, well prepared. A wonderful new addition is their chlorophyll soup, in which a blend of greens is flavored with a powerful seafood broth. I spent a lot of time researching fado for a novel in progress, so I was thrilled to see this line made famous by Amália Rodrigues. Casa de Pasto (Rua de São Paulo, 20; phone: 213-471-397). Interesting takes on traditional Portuguese food. Their razor clam soup is wonderful and other dishes were delightful and tasty. Prices are a bargain for food of this quality. They showcase excellent wines from new Portuguese producers and have opened a wine bar on the ground floor with a small but well-chosen selection of Portuguese wines, available both for drinking their and at their outside tables and to take away; the restaurant is one flight up. Their plans to create a boutique hotel on the upper floors have fallen through at least for now, however. Service is friendly and professional, and the restaurant has a hip design, with perhaps the most fanciful looking bathrooms I’ve seen in a restaurant anywhere. Trendsetter and Hipster approve. De Castro (Rua Marcos Portugal, 1; phone: 215 903 077) A less formal, but I think more interesting, restaurant from the chef of Largo. Outstanding fresh seafood and fish, innovative dishes, including de Castro’s renowned clams with butter beans. Service is excellent and knowledgeable. Prices are a bargain for food of this quality. The restaurant looks out on the pretty Praça das Flores in the Principe Real neighborhood. Some new dishes have been added to the menu for 2015. Food stands and happy diners at the Time Out Marketplace. A Cevicheria (Rua dom Pedro V 129; phone 218-038-815). Excellent super fresh fish and seafood is used to make ceviches with combinations that are interesting, tasty and different from the standards found in many cities around the world. Their prawn gazpacho with tapioca is a great starter. I especially was impressed by a dish called Sea Quinoto in which quinoa deeply flavored with seafood broth is combined with various shellfish. Cantinho do Avillez (Rua dos Duques de Braganca 7; phone: 351-211-992-369. An informal restaurant from José Avillez, the chef of the wonderful Belcanto. The menu is meat-heavy with renowned steak sandwiches, but the appetizers and fish dishes are especially good. Chefe Cordeiro (Praca Comercio 20/23; phone 216-080-090) A less formal restaurant from the chef José Cordeiro of Feitori, which has a Michelin star. The food at this restaurant is pleasant but far from Michelin quality. The room is gorgeous and has a view of the beautiful Praca Comercio. If you want to eat on the Praca this is the place to go, but it is not a destination. Cafe Lisboa Largo de S. Carlos, nº23; phone: 211 914 498) A bistro with Portuguese influence from José Avillez, the chef of the wonderful Belcanto. The café has a room inside the theater and also tables in the plaza in front of the Sao Carlos Theater, a beautiful setting for tasty food. Decadente (Rua de São Pedro de Alcantara 81, Bairro Alto, phone 213-461-381, theindependente.pt). A fun but noisy restaurant. The décor and waiters have adopted the Brooklyn look. The service unfortunately is very inattentive. The appetizers were interesting but somewhat lacking in flavor. The main courses were tastier, and dessert excellent. Prices are extremely reasonable. 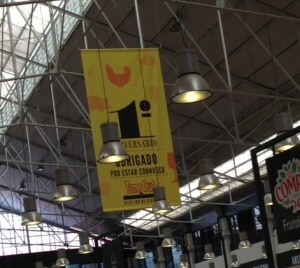 A good, but not great addition to Lisbon’s food scene. Pharmacia (Rua Marechal Saldanha 1; phone 213 462 146). A beautiful funky room inside the Museum of Pharmacy furnished with tables and other antique hospital equipment. The 28 euros tasting menu is a steal and the a la carte menu also is a bargain. The tapas portions are almost entree sized and most are 10 euros or under. Dishes are traditional Portuguese reimagined with contemporary techniques. Not all the dishes are successes, but overall a meal here is fun, with friendly service and great views of the Santa Catarina miradouro. The majority of dinners were locals when we ate there in 2014. 1300 Taverna (Rua Rodrigues de Faria 103; phone 213-649-170) Located in LX Factory, a fun complex of stores and restaurants. Beautiful décor but mediocre food. Cervejaria da Esquina (Rua Correia Teles, 56; phone 213-874-644; cervejariadaesquina.com). Excellent super-fresh seafood: They have a wide selection of raw seafood: oysters crab, shrimp, barnacles. Their dressed crab appetizer is deservedly famous. Their shrimp soup has a richly flavorful stock with tasty fresh shrimp. The less elaborate dishes that let the seafood dominate are best. Largo (Rua Serpa Pinto, 10A; phone 213-477-225) An excellent seafood restaurant with fresh ingredients carefully prepared. Their fish and seafood soup is outstanding. Main courses are more traditional, well-prepared but sometimes boring. The restaurant is in a beautiful space and the service is friendly if not entirely polished. Ramiro (Av. Almirante Reis nº1; phone 218-851-024) Fresh seafood, but way overcooked. Cervejeria da Esquina is a better choice, but Ramiro tends to be more of a tourist destination due to its location. Take a taxi. 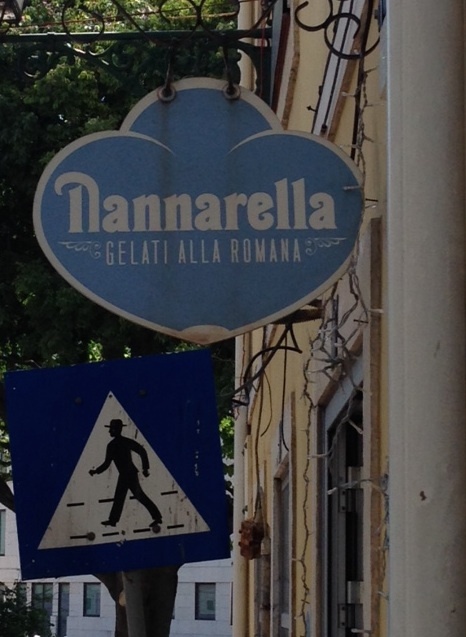 Nannarella may be the new kid in town, compared to Santini, founded in 1949, but we think this small shop started by an Italian woman living in Lisbon is far and away the best ice cream in town. Time Out Mercado da Ribeira (Avenida 24 de Julho, Cais do Sodré). Half of the building housing an old food market remains a series of stalls with fish, meat, produce, and flowers. 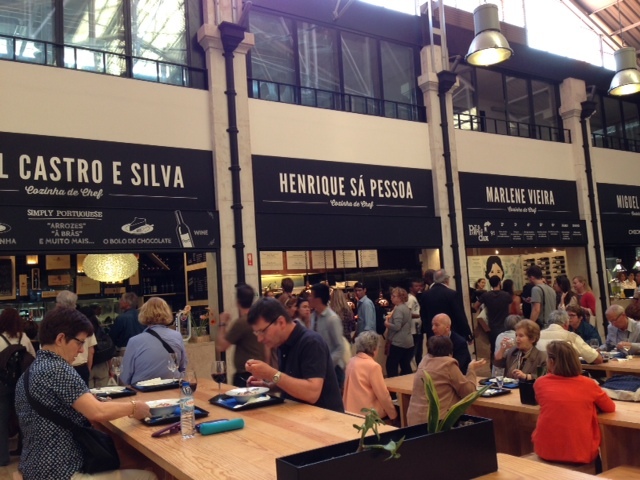 The other half has been turned into an upscale food court with stands from a variety of Lisbon restaurateurs. Some are famous and mediocre such as the steaks and steak sandwiches at Café de São Bento. Others are excellent: the fish soup of Cozinha da Felicidade, the fish carpaccio of Henrique Sá Passoa, and the tartars, both fish and meat, at Tartar-Ia. The small dishes of Marlene Vieira and the ice cream of Santini are good but not great. There also are stands where you can get cheeses, cured meats, cookies, chocolates, and more to go. In any case, it is a fun experience to see and taste multiple small dishes and to see the crowds of happy local and foreign eaters and drinkers. The market is open 7 days a week: from 10am to midnight (Sunday to Wednesday), and 10am to 2am (Thursday to Saturday). Tágide Wine and Tapas Bar (Largo da Academia Nacional de Belas Artes 18 and 20, Chiado; phone 213-404-010, restaurantetagide.com; closed Sundays). This restaurant has beautiful views of the river and the tapas are excellent as well. Soups are wonderful, and I especially enjoyed their Mozambique Tiger Prawns with seafood and herbs ‘Açorda’. Good selection of wines. Tagide also has a restaurant with a tasting menu. Antigo 1 de Maio (Rua da Atalaia 8; phone 213-426-840). Traditional Portuguese dishes, extremely friendly service in a pretty room. Prices are very reasonable. Zaafran (Largo Dona Estefânia, nº7; Metro Picoas or Saldanha; phone 213-558-894). Closed Sundays. This would be a top Indian restaurant in any US or European city, and well-regarded in London. The owners are Indians who lived in Mozambique, and there are subtle African elements in some of the dishes. Be aware: Thursday nights they have belly dancing and a set menu. Lapa Restaurant (in Lapa Palace hotel, Rua Pau da Bandeira 4; phone 213-949-494) If you are dying for Italian food this is good though way overpriced, but in any city with excellent Italian food, this would be considered mediocre. Pizzaria Lisboa (Rua dos Duques de Braganca 5H; 1200-162 Lisboa; phone 351-211-554-945). A pizza restaurant from star chef Jose Avillez. The best pizza I’ve found in Lisbon. The crusts are good but not outstanding, but the toppings are varied and excellent. There are more than twenty choices. I especially liked the one topped with truffled mortadella and the mushroom. Our “small world” story. Sérgio Martins and his cousin Tiago owned a fish store when we lived here in 2012. We shopped at É Fish almost every day, but after we left, it closed. Some months ago a photographer I followed on Instagram, @freelancer767, started posting pictures of Nannarella and invited me to the store during his shift. He happened to be none other than…Sergio! 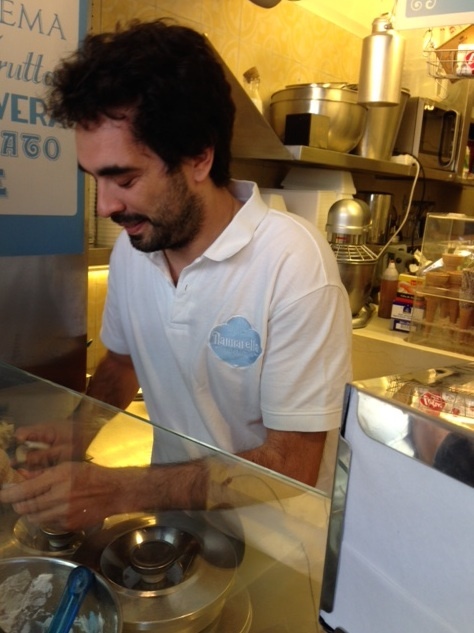 Tiago also works there, making the ice cream. Nannarella (Rua Nova da Piedade 68; phone 926-878-553; open noon to 7:30 pm every day except Sunday). The best ice cream in Lisbon. Their chocolate ice cream is outstanding, rich with just the right touch of bitterness to cut the heavy creaminess. The cream overwhelms the fruit flavors, but mint, amaretto, and other non-fruit flavors and sorbets are excellent. The amaretto, with crunchy bits of biscotti, was especially delicious this year. Artisani (various locations in Lisbon and also in Cascais). Rich, flavorful ice cream, almost as good as Nannarella. Fragoleto (Rua da Prata 61; phone: 213-479-472; open noon to 8pm daily). Numerous flavors with original combinations, all made with organic ingredients only. Unfortunately, the flavors often are weak. Quality is less than Nannarella or the multi-location Artisani. Nannarella’s Italian-born owner makes the ice cream. Photo ©2015 by Sérgio Martins; used with permission. Santini (various locations in Lisbon). This is the well-known, tourist-clogged ice cream place. They are good but their ice cream is clearly several notches below Nannarella and Artisani, although their sorbets are top-notch. Claudio Corallo Chocolate (Rua Cecílio de Sousa 85; phone 213-862-158). Outstanding hot chocolate (a bargain at 1 Euro for a small cup) and excellent chocolates, albeit at high prices, which have doubled since 2012- now 90 euros a kilo, $55 a pound. Chocolataria Equador (Rua da Misericordia 72; phone 213-471-229). Dark, milk and white chocolates with a variety of flavorings from fruits to curry. 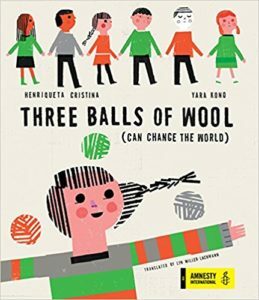 As good as Claudio Corallo but at half the price. Nata: Pasteis de Belém is classic, but we think the best Pastel de Nata is from a store simply named Nata. They no longer have a location in Principe Real on Rua Dom Carlos V. Now they have 2 Lisbon locations: Rua de StªCruz do Castelo, 5 a 11 and Rua da Prata, 78, as well as locations on Cascais, Porto, Braga, Coimbra and more. More recently, they have added sandwiches and empadas (savory pastry snacks) to the menu. The lunch menu is basically an adequate starter to the main attraction—the dessert. Ha! What a small world indeed. And what a great list of restaurants, Lyn and Richard! Yes, we never thought we’d see them again after their fish store closed, and it was quite the thrill to find them. They were among the people who gave us such a lovely welcome when we first lived in Lisbon. Probabily this article was payed by the owners who was mentioned. To say that Nanarella is best than Santini obvious they dont undestand nothing about gelato. Obviously there are many people who go to and enjoy Santini, but over 3 years of visits to Lisbon we have observed the quality at Santini decline. They are resting on their reputation, while Nanarella is making an effort and succeeding in producing outstanding ice cream. Xe, if you prefer Santini keep going there. You will make the line at Nanarella one person shorter. I will continue to offer my judgment on which ice cream store is the best, an opinion based only on my taste and not any other consideration. Yummy. It makes me want to hop on a plane right now for Portugal. Thanks so much, Richard. I’m keeping this list close at hand. Hi Sandra and Richard, I agree that Santini declines quality over the time but STILL is the better ice cream, I think the time will give me reason (actually, for me there are some ice cream parlors that are simply fads and people will follow). And Sandra, if you want to go to the Lisbon just to visit Nanarella, dont waste your time and go to Rome instead and visit San Crispino or Dei Gracchi Ice cream parlors. Thanks and regards. Thank you for your comments, Xe! I wouldn’t worry about Sandra coming to Lisbon only to visit Nannarella. She would be coming to visit Richard and me. And thank you for the recommendations of ice cream parlors in Rome. Our daughter has a friend in Rome and I will let her know about these for the next time she visits her friend. In the meantime, watch for our roundup of five great ice cream places in our neighborhood in New York City, which we’re putting together for this blog in July. Xe I love San Crispino in Rome. A great suggestion. I forget if it is them or another store in Rome that makes wonderful marron glace (candied chestnut) ice cream.